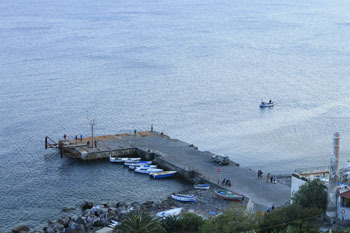 The history of Filicudi, such as for the whole archipelago develops into the sea, the source of support, work and innovation. The population’s vocation towards the sea, and the inescapable bond with it, formed in the course of millennia, marked the whole cultural panorama and the life’s style, even today, evident in local traditions. The need of support pushed, for millennia, the inhabitants towards the sea, the inexhaustible source of primary resource. Sailing the waters of the archipelago, which rapidly sink more than 2,000 metres, is an unforgettable experience which will totally please you. Sailing the Aeolians, without watching out for dangers which are there, may bring unpleasant surprises. Being of volcanic origin, the coasts, in numerous points, are surrounded by rocks and shallows near to the shore. 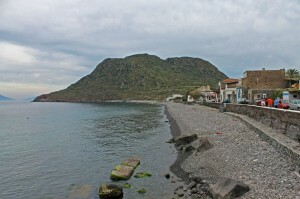 Filicudi is principally formed by two elevations: Fossa delle Felci, 773m high, whose southern slopes are steep and uninhabited, while northern and eastern sides are cultivated and inhabited; another elevation is that of Capo Graziano, 174m high, connected with the other one by a flat isthmus, which from the sea makes the islands appear like two independent islands. The seabed around the island are very deep, except for the northern and the north-eastern part, where it is advisable to sail at proper distance because of the rocks. Another point where to watch out is the one corresponding to the south-eastern point of Capo Graziano, where a shallow of 2,5 m makes the sailing very dangerous, especially in case of rough sea. On the north-eastern side it is possible to sail without any danger between La Canna and Filicudi, well-known for its rocks and its wonderful seabed which do not exceed 17 metres of depth. 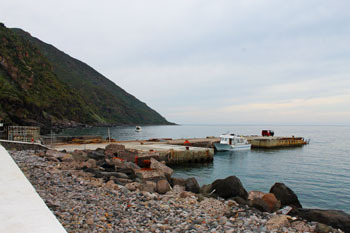 The adjacent port area of the Port of Filicudi seabed allow the mooring, even if you should watch out for underwater cables, and for meteorological conditions because this point is very exposed to winds of I quadrant and, partly to those of sirocco. To the north from Capo Graziano there is a creek where a pier made of concrete was built; it is 55m long and 12 m large, the depth in the header is of 9m and of 6m on the broads, it is equipped with bollards and fenders, permitting the mooring to small boats, and being a good shield against the winds of III quadrant, and mediocre with those of II and IV one. The most safe harbour against the winds of I quadrant is near the Beach of Le Punte, situated on the southernmost part of Capo Graziano. The frontal part of the pier is used only by ferries, the southern one to hydrofoils, while the northern one is used by pleasure crafts and by fishers’ boats, with the only condition not to hamper line means. The harbour area is equipped with gas station, slipway, crane, water valves, electric energy, and there are also the services of mooring, storage facilities, and garbage truck. Watch out for underwater breakwater, situated between the slipway and the wharf. The jetty of Pecorini, situated south of the mountainous principal complex in correspondence to the namesake hamlet, represents a good mooring point for the pleasure-boat owners, who can use a jetty 45m long, and 10 m large, with a seabed in extremity of 8m, and of 4-5m at sides. It is a good shield against the winds of I and IV, while it is completely exposed to those coming from the II and the III quadrant. The only provided services in the adjacent area are: a crane, boat storage, mooring and garbage truck.